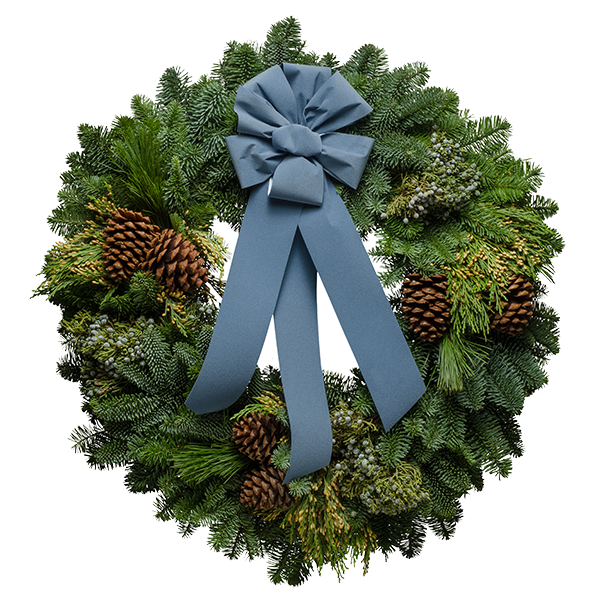 Beat the holiday blues with this unique Christmas wreath featuring a French Blue ribbon complemented by pastel blue juniper berries. Combine them with the deep aromatic evergreens, and you have a beautiful Christmas wreath that is a sensational palette of colors, textures and scents of the season. "Thank you for such beautiful wreaths! The Blue Glacier wreaths arrived the day before Thanksgiving so everyone got to take one home with them after turkey dinner. To open the box and be overwhelmed with the smell of the greenery brings back so many memories."